The reason behind writing this article is the mails I am receiving from past few days. Since past 15 days I have received around 10 mails regarding this drop box error code 403. So I decided to write a comprehensive guide on this issue. 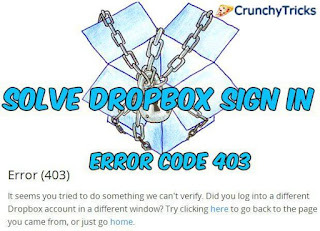 As I can notice that people are facing this error at two times firstly when they try to log in into dropbox and secondly on accessing their files stored in drop box. One of my reader sent me a mail saying “Whenever I try to access files stored in my drop box, it keep on showing me this 403 forbidden error code. I have not made any changes in my Dropbox setting still I am getting this error. Help me please!“. On researching I came to now that even if your login details are correct still you won’t be able to view your files. This is only because of this error. It is seen that drop box has issue with most of the browsers but specially major amount of people are facing it on Google Chrome and Firefox. This is only because of dropbox’s own cookie or browser’s cookie problem. On deleting either drop box specific cookies or web browser’s cookies you’ll be able to resolve this issue. Due to cookie problem sometime Google chrome stops working also. This issue can happen on any operating system such as Windows XP or Vista, Windows 7 or 8, Windows 10 and even on Windows phone and Mac (iOS devices). Now select “Settings” from the menu. This will open up settings page simply scroll down to the end of the page and click on “show advanced settings”. Then click on “Content settings” from the privacy menu. A new window will pop up. Click on “All cookies and site data”. Now search for dropbox in the Search box. It’ll show all the cookies stored for the drop box. Select it and delete the item completely. Save you work by pressing Done. That’s it, you’re done. Try to log in again and now you can view your files. If still error exists then delete all the cookies stored in your Chrome web browser. Now select “Options” from the menu. A new window with open with all the settings. Now select “Privacy tab” from the left side menu list. From there search for remove individual cookies and click on it. Just search for Dropbox and delete all the cookies by clicking on remove selected. Try to sign in if it doesn’t work then delete all the cookies. Now tap on the ellipses (…) from the bottom right side. Scroll to the bottom of the page and search for Delete history. Simply click on it and tap confirm button. It’ll take some time to clear all the cookies and history of your mobile browser. If you’re on Mac and using Safari browser then just follow these steps an get rid from dropbox sign in error 403. Open your Safari browser and select “Safari” from the top left corner next to the apple logo. Now select Clear history and website data from the menu. That’s it. Simply log in and you won’t face this error. Note: – Restart your web browser for the changes to take effect. So this was all about how to resolve dropbox login error 403. Hope using one of the above mentioned methods your problem is gone. Still if you’ve any doubt or query then feel free to leave a comment below in the comment section.